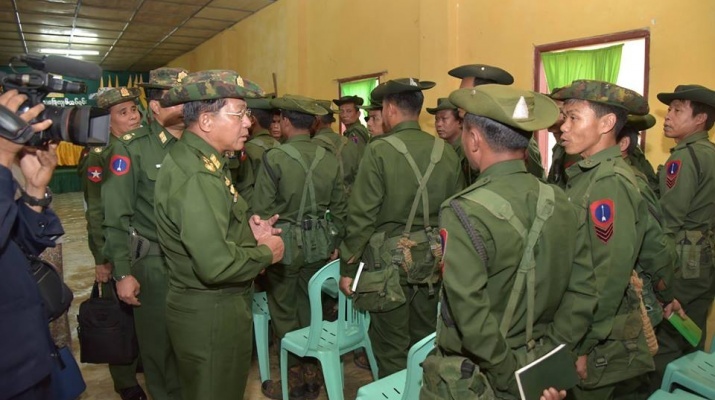 The Tatmadaw is to prevent any threats to the country’s stability and peace, the government’s administrative mechanism and the lives and property of the people. 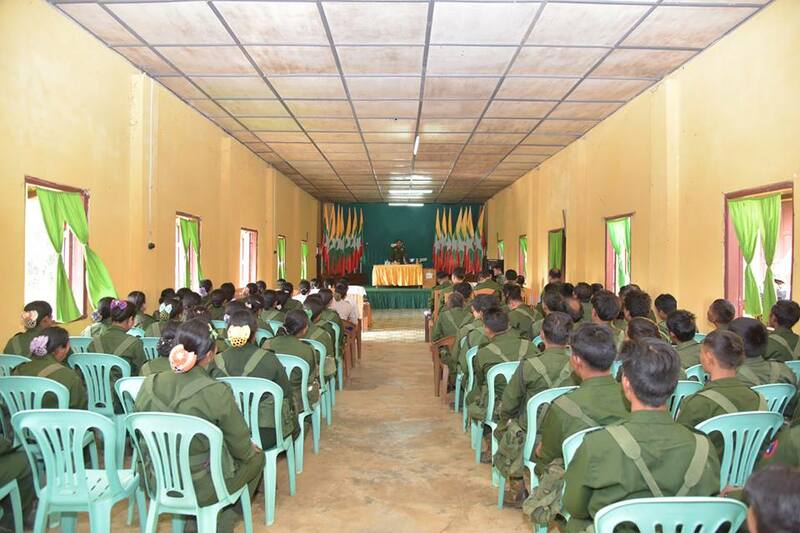 The Tatmadaw is not attacking ethnics and religions and is safeguarding the State and lives and property of the public, said Commander-in-Chief of Defence Services Senior General Min Aung Hlaing at a meeting with officers, other ranks and their families of a local battalion in Shaduzup Village in Tanai Station this evening. 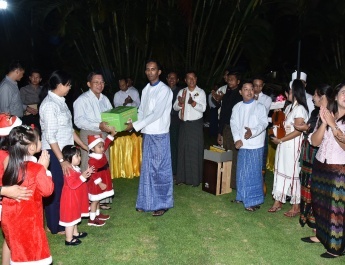 It was also attended by the Senior General’s wife Daw Kyu Kyu Hla, Commander-in-Chief (Air) General Maung Maung Kyaw, senior military officers from the Office of the Commander-in-Chief (Army), the Commander of Northern Command, officers, other ranks and their families from the local battalion. 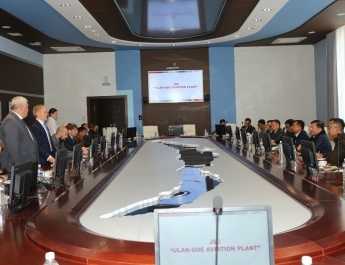 In his speech, the Senior General said in December 2017, KIA insurgents attacked the battalion headquarters in surprise. KIA insurgent group had to withdraw as officers, other ranks and their families from the battalion could fight back against them in a brave manner. It is found that insurgents are not working for the interests of region, ethnics and the country. They are doing destructive acts alone in their own interests under the pretext of the various reasons. The Tatmadaw had to defend the country as the Communist Party of Burma fought the incumbent government. The Tatmadaw had to maintain the country’s situation in order to safeguard the independence and sovereignty and the non-disintegration of the Union. There are many ways for them to do for the region, ethnics and the country in accordance with the law. It is impossible to march towards the democracy by means of armed struggle line. Now we are on the NCA path to reach an eternal peace. The Senior General continued to say that brave act by officers, servicemen and their families against KIA insurgents which attacked their battalion is waging a fair war. Thanks to the systematic military training given to each serviceman as well as to their wives, they could fight back against insurgents with the effective use of it. Their wives have a motherhood mind to safeguard their offspring and family members when there are dangers. He would like to honour them as they are in mood to protect their offspring and the station. It is a great honour to see that Tatmadaw families could bravely fight back against insurgents who attacked the headquarters. Wives of Tatmadawmen are the main reserved forces of the Tatmadaw. The counter-attack of families of the Tatmadawmen in unity on the insurgents was “strength” of the Tatmadaw. As their endeavours were their history and that of the battalion headquarters as well as that of the Tatmadaw, it needs to maintain the history for successive generations. All officers, other ranks and families discharging duties in the Tatmadaw are national brethren from all corners of the nation, and they are carrying out the tasks in unison at the military unit. 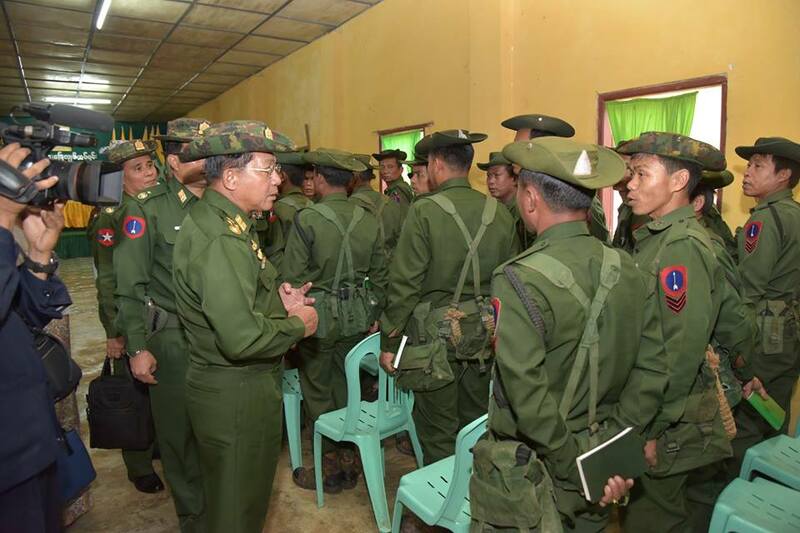 Then, the Senior General noted that as the Tatmadaw is being built to become a Standard Army, efforts are being made to improve technical education and learning education of the Tatmadawmen. Moreover, their ranks are promoted depending on designated terms and their strenuous efforts. They are allowed to have rights in conformity with the respective ranks. The Tatmadaw arranges their convenience in basic needs of accommodation and food. Defending the State is the first duty of the Tatmadaw while the nation-building tasks become the second duty. 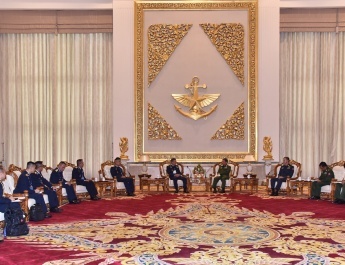 The Senior General stressed the need for all to culture their spirit to happily discharge duty in their service-term as they join the Tatmadaw of their own accord. Leaders at different levels need to have equal term of administration over them. If all the Tatmadawmen abide by orders, directives, rules and regulations, the Tatmadaw will have improvement. quarters is to contribute towards food sector of families of the Tatmadawmen. The Senior General urged all families of the Tatmadawmen to undertake manageable scale agriculture and livestock breeding tasks as much as they can so as to fulfill requirement of their food sector. Likewise, he urged them to help their offspring to learn education as inheritance. The Senior General noted that as the military unit is located in the rapid changes area of climatic condition, they all need to take care of their health and avoid indulgence as much as they can. 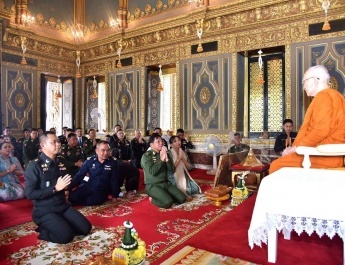 Then, the Senior General and wife presented Buddha images made of various flowers, Bibles, cash awards and foodstuffs to officers, other ranks and families. The wife of the Senior General gave cash to the fund of the station Maternal and Child Welfare Association. Then, officers, other ranks and families accepted them. 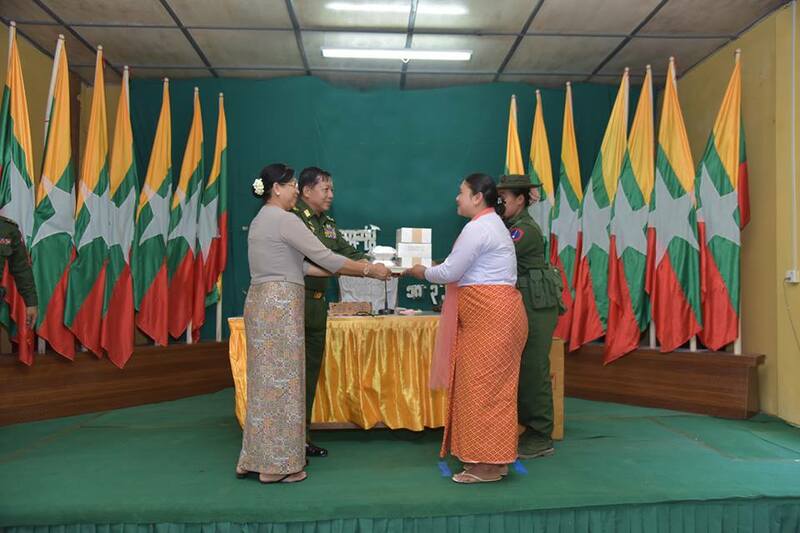 General Maung Maung Kyaw, Lt-Gen Tun Tun Naung of the Office of the Commander-in-Chief (Army) and Adjutant-General Lt-Gen Hsan Oo presented fiction and non-fiction books, sports gear and cash awards for officers, other ranks and families of the battalion through officials. After the meeting, the Senior General and party cordially greeted the officers, other ranks and families from the station. Then, the Senior General, wife and party posed for documentary photo together with wives of the Tatmadawmen from the local battalion. About 70 KIA insurgents from three dimensions attacked the headquarters of the local battalion with the use of heavy and small arms three times on 30 December morning 2017 and on 22 January 2018 with the use of heavy and small arms many times. Officers, other ranks and families bravely made counter-attacks on and combated the insurgents. In the incident, two Tatmadawmen sacrificed their lives for the State. Although KIA insurgents who aimed to have military gain committed surprised attacks on the headquarters of the local battalion where there were some Tatmadawmen and families only, the Tatmadawmen and their wives and families of the headquarters unitedly and bravely made counter-attacks on the insurgents. Hence, the enemies withdrew from the place leaving their many dead and injured members whenever they attacked the headquarters of the battalion.